【Wide Application】Perfect for all of your electrical wiring needs including cable insulation, spliced wires, wire bundling, and all-around household tape. 【Dimension】Length: 15 M/ 50 Feet/ 600 Inches; Wide: 1.5CM/ 0.05 Feet/ 0.6 Inches; Colors: Black, Red, White, Green, Yellow, Blue. 【Good Material】Made of PVC, Strong rubber adhesive, Excellent insulation, High flame retardant, Excellent resistance to voltage and low temperature. 【6 COLOR】Black, Red, White, Green, Yellow, Blue. 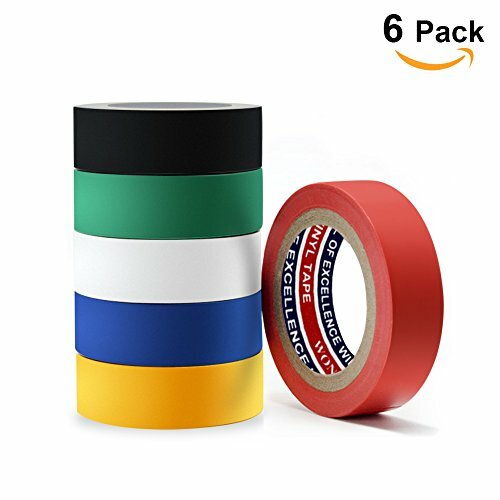 The assorted colors make this tape especially handy wherever color coding is needed or desired. 【AMTEKER CUSTOMER SERVICE】30-day money back and 12-month warranty. and professional after-sale service within 24hrs. different color waterproof electrical adhesive tape, I could use them for different places to protect additional. Prepare in advance is better than nothing.Good quality and Nice choice!